What is your most important asset? Is it your health? Is it your family? 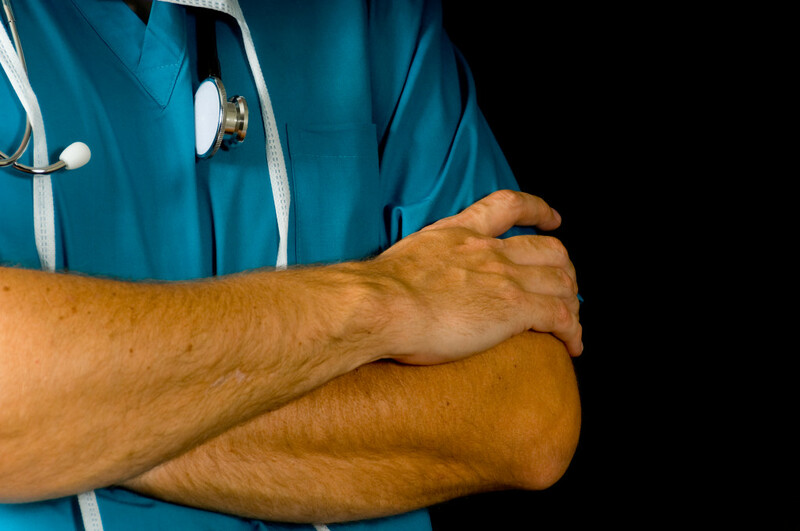 Is it your family’s health? The more precious our asset, the more important our focus on protecting that asset! For our health and the health of those we love a healthy immune system is critical. Our immune system is a wonderful and complex defense system designed for the protection of our health. It is designed to protect our cells from intrusions from the outside which could cause our body damage. It uses a huge army of defender cells – different types of white blood cells. We make about 1000 million of these cells every day in our bone marrow. Some of these cells, called macrophages, are constantly patrolling within our body, seeking to destroy germs as soon as they enter. Adding USANA Proglucamune to your daily nutritional regimen could be one of your most important decisions to help support this complex defense system. Let’s use a nation’s armed forces as a simple example of the purpose and function of our immune system. The branches of the armed services, Army, Navy, Air Force, Marines and Coast Guard all have different weapons and specialties but work together to defend and protect the citizens of a nation. To work at the highest level, all these branches need to communicate with each other, work together and maintain the weapons to the highest level to be effective. USANA® Proglucamune® supports the intelligence within our immune system “armed forces” and maintains the weaponry necessary to attack any foreign invaders. surface immunity (the wall): our first line of defense to keep pathogens (the bad guys) out! innate immunity (the army): immune system cells that attack foreign cells in the body if they get past the surface immunity! adaptive immunity (the special forces): acquired immune system because we are not born with it. It is developed through the years as a response to the pathogens that we encounter along life’s journey! If a pathogen (bad guy) penetrates our surface immunity (the wall), the innate immune system (the army) receives the alarm to go into action (to seek and destroy the enemy). The InCelligence™Beta-Glucan Complex of USANA® Proglucamune® binds on immune cells to prime their natural protective abilities. In other words, this unique and powerful complex, strengthens and supports the critical fighting force of our inner armed forces! If our innate immune system (the army) is overwhelmed, USANA® Proglucamune® also supports the adaptive (special forces) that are called into action if they are needed. 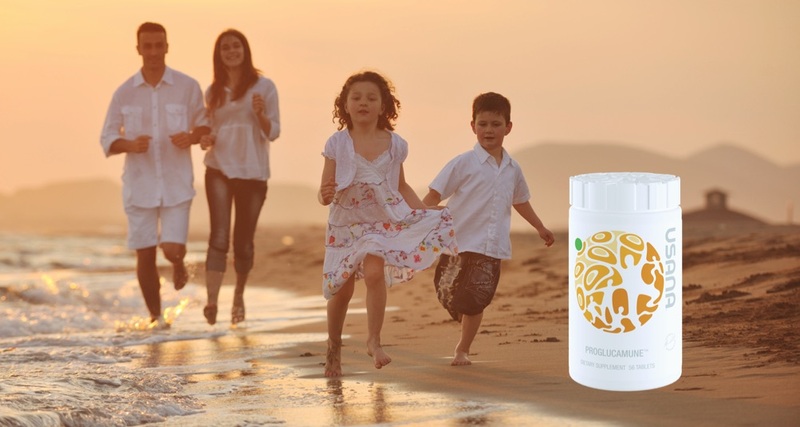 Question: What are the core ingredients in USANA Proglucamune? Question: Who is USANA Proglucamune designed for and why? Question: Why is it important to take USANA Proglucamune? Question: What are the core benefits to USANA Proglucamune? Question: How does InCelligence work in USANA® Proglucamune®? Eye Health: Visionex® – Macula Sunglasses! Most people don’t think about eye health until something goes wrong. However, free radical damage from the sun and air pollution (to mention just a few threats) can cause subtle and growing damage to our eyes. In fact, macular degeneration is the leading cause of vision loss in the US, affecting more than 10 million people. That is more than cataracts and glaucoma combined. It is the deterioration of the central portion of the retina in the back layer of our eyes. This area snaps the pictures of what we see, records them and sends the images to the brain via the optic nerve in our eye (interpreting the images as what we “see”). Those who develop deterioration of the Macula will begin to have a central hole in the picture they are seeing. This hole can continue to grow like a photograph burning from the center to the edges. Advanced Macular Degeneration is considered legal blindness. To date, there is no outright cure for macular degeneration. This makes prevention an even more important topic! There have been studies suggesting that a diet including salmon and other cold water fish can be of help. The key here is the fish which contain high amounts of omega-3 fatty acids may help in the prevention of Macular Degeneration or its progression (see article in Allaboutvision.com). Biomega™, USANA’s double-distilled, pure fish oil capsules would be a fantastic addition to anybody’s diet to obtain the important levels of omega-3 fatty acids for cellular health – including eye health. Visionex®– Sunglasses to protect the Macula! 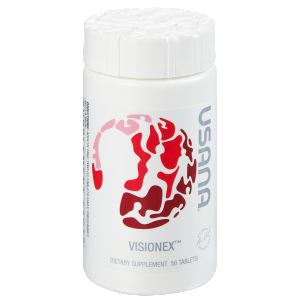 The USANA scientists have designed the Visionex® product with eye health prevention as the the center focus. Two very important antioxidants have been shown to be effective in helping protect the macula in the eye – lutein and zeaxanthin. Both these antioxidants are naturally occurring protectorates found in plants! Plants need sunlight for the process of photosynthesis but can also protect themselves from the damage of excessive solar radiation by these two antioxidants found in their structural make up. Lutein is believed to act as a filter of the high-energy blue light from the solar radiation as well as act as an antioxidant, stopping the free radical damage that would occur from excessive exposure. Zeaxanthin is an even more powerful antioxidant against free radical damage that the plants have in their arsenal! One of the most important choices we can make to protect our eyes from the free radical damage of the sun is wearing polarized sunglasses on the outside. Adding the USANA Visionex® product (and Biomega™) to your nutritional regimen can serve as an extra, inner layer of sunglass protection of the vitally important macula in our eyes. In addition to lutein and zeaxanthin, the USANA Visionex® product contains bilberry extract, vitamin C and zinc to maintain healthy capillaries and provide additional antioxidant protection. This impressive combination of antioxidant support is like inner putting on the inner sunglasses daily just as you do on the outside when you face the potential damage of the sun! In conclusion, don’t wait until your eye health is starting to deteriorate. Prevention, prevention, prevention! Now is the time to take care of a few of our most precious gifts given to us by God – our eyes! USANA – Trusted Partner & Sponsor of Dr. Oz show! As Dr. Oz mentions, USANA’s Procosa™ contains a unique blend of Curcumin and vegetarian glucosamine to help maintain healthy joints and cartilage. Click here to read more about our special Procosa™ product. Be sure to “like” the Performance Vitamins Facebook page to learn about the health benefits of other USANA products that Dr. Oz will be highlighting on his show!